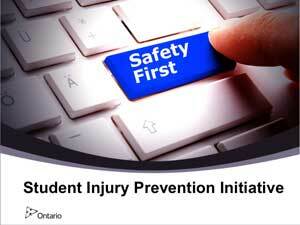 Recently the Ministry of Education announced funding for a Student Injury Prevention Initiative for Ontario schools. (please refer to Ministry of Education memorandum from George Zegarac, Deputy Minister of Education dated January 30, 2013). The Council of Ontario Directors of Education (CODE) has been engaged by the Ministry to assist with coordination of this important initiative. Accordingly, CODE has established a Health and Safety Team which will have responsibility for identifying a common set of provincial health and safety promising practices; supporting the training of school board staff and inspection of technological education facilities and science labs as time permits, and collecting resources to be shared with boards. CODE will also liaise with boards regarding the optimal use of expenditures for this initiative and the completion of board financial reports. Student Injury Prevention Initiative Presentation. Information and updates regarding the work of the CODE Health and Safety Team will posted on a regular basis. The resources and information on this website and developed as part of the CODE Health and Safety in Schools Project are to be considered as suggestions only and are provided on an "as is" basis without any warranty, guarantee or representation as to the correctness, suitability, fitness or sufficiency of any information contained in the resources. Use of any of the materials, including without limitation, the resources, recommendations, activities or articles is entirely at the discretion of individuals accessing these materials (the "Users"), and any such use means that the Users agree that neither the Council of Ontario Directors of Education nor the CODE Health and Safety in Schools Team nor individual contributors on behalf of themselves, their agents, subcommittees or anyone acting on their behalf assume any responsibility for any of the materials, resources, recommendations, suggestions, activities or articles herein, and are released from any liability whatsoever, however caused or arising in connection therewith. The Council of Ontario Directors of Education and the contributors disclaim any liability for any injury, loss or damage of whatever nature resulting from the use of any materials developed or presented as part of this project. Users specifically acknowledge and agree that it cannot be implied that all acceptable health and safety measures are contained in these resources or that other measures may not be required in such circumstances or conditions that are applicable to a User's School premises, and that the User will therefore make the User's own determination in this respect, having regard to the User's personal circumstances. Please note that the safety checklists included in the following resource guides are intended to offer principals, vice-principals and supervisory officers an overview of health and safety requirements for science labs and technological education facilities, and to provide an opportunity for ongoing discussion with teachers. These checklists are not intended to provide a comprehensive assessment of science and technological education safety; rather, they can be used to initiate an open and collaborative dialogue between principals and teachers to enhance student safety in science labs and technological education facilities. Furthermore, this checklist is not a set of safety requirements prescribed by CODE. Rather, the checklist represents recommended best practices. Before using the Health & Safety Resource Guides we encourage you to read the letter of Introduction & Instructions. The following resources from the guide Student Safety in Secondary Technological Education Grades 9 to 12 A Resource for School Administrators are categorized by emphasis courses and provide an easy references for student safety in each emphasis course. Student Safety in Secondary Science Education Grades 9 - 12. Avant d'utiliser le Health and Safety Guides de ressources, nous vous encourageons à lire la lettre d'introduction et les instructions. The following executive summary highlights the scope of the 2012-2013 CODE Student Health and Safety in Schools Project. It reports recommendations from the field and outlines resources available to support boards as they work to ensure the prevention of student injury in their schools and facilities. In October, 2013 as part of CODE's support for the Student Injury Prevention Initiative, the Council of Ontario Directors of Education, the Ministry of Education and the Public Services Health and Safety Association (PSHSA) partnered to offer regional sessions throughout the province. Over 375 participants from 71 boards came together to learn about the resources developed by the CODE Health and Safety team and PSHSA, and share effective practices and solutions. These one day sessions provided a valuable opportunity for superintendents, elementary and secondary principals, science and technological education leads and health and safety officers to offer advice and suggestions on implementation of the resources and build networks. The slide presentation shared at the regional sessions is available for downloading and use with your staff. Download the PowerPoint presentation in English. Download the PowerPoint presentations in French: Resources - Ministry Presentation. These eLearning modules have been designed to support principals, vice-principals and supervisory officers in the promotion and implementation of health and safety provisions and requirements in schools. Developed as a support to the Student Injury Prevention Initiative, they provide school leaders with greater understanding of, and engagement in, their responsibilities and duties regarding health and safety in science and technology classrooms, science labs and technological facilities, and in the creation and sustaining of a positive safety culture within schools (Ontario Ministry of Education, Memorandum, George Zegarac, Deputy Minister, January 30, 2013). The information contained in these modules was compiled through a series of consultations with school board health and safety representatives and with partner organizations that offer health and safety services to the education sector. Download the PowerPoint presentation as a PDF. The aim of the CODE Health and Safety in Schools Project and the Health and Safety Team is to act as ambassadors and champions for the project and to foster the delivery of a high quality product that meets the goals of the project. Membership on the Team. The CODE Health and Safety Team consists of experts in the area of science and technology safety within school settings. Download this PDF document for more informaion on the Purpose/Mandate and team members. The following memorandum and letters to date reference CODE's role in the Student Injury Prevention Project. (3) Fifteen boards have been asked to provide support and advice to the CODE Health and Safety Team and offer opportunities for discussions with principals, teachers and board health and safety staff. In addition, some technological education facilities and science labs may be viewed to inform the work of the CODE Health and Safety Team. (4) CODE with support from the Ministry of Education has developed: 1. A School Board Survey and 2. A Reporting Template. The reporting templates are to be available for download in the section Financial Reporting Template. To further support the work of the Ministry and the CODE Health and Safety team, boards are asked to complete the on line survey as soon as possible. This survey will gather a provincial perspective on the status of health and safety in school board's technological education facilities and science labs, and the data will help to inform CODE's work in supporting school boards with addressing the recent Ministry of Labour (MOL) inspection results. A reporting template will be used by both the Ministry of Education and CODE for school boards to report on their spending and identify the impact of the funding on science labs and technological education facilities. A provincial summary of school board spending and the results of the Student Injury Prevention Funding Initiative will be completed by CODE. The Ontario Council for Technology Education (OCTE) was formed to represent Elementary Science and Technology and Secondary Technological Education Teachers in the province of Ontario. OCTE is a registered, non-profit organization governed by constitution and the will of its membership. The Science Teachers' Association of Ontario (STAO)/L'Association des professeurs de sciences de l'Ontario(APSO) is currently in the process of accepting proposals for its annual conference in Toronto, November 16-16, 2013. This is the largest professional development conference in Ontario organized by Ontario science teachers for Ontario science teachers. The following overview of STAO/APSO is taken from its website. The following vendors/companies have indicated an interest in providing services to school boards in regards to their work in the area of Health and Safety. Use of these vendors/companies is entirely at the discretion of school boards. Machine safety and guarding, machine control and sensing and motion control applications. Products and Services: Machine Guarding, Roof Guarding, Inspections, Installations, Service and Repairs. Injury and illness can be prevented when schools take a proactive approach to health and safety. Dedicated to improving health and safety in Ontario's Education sector, the Public Services Health and Safety Association (PSHSA) offers the necessary training, services and resources to eliminate injury and illness in Ontario schools. Musculoskeletal disorders, slips, trips and falls, violence, exposures to chemicals or biological hazards, and contact with/struck by injuries are among the most common hazards facing the Education sector today. To address these and other concerns, PSHSA offers a wide selection of training courses in a variety of formats, including: classroom education, eLearning and webinars. In addition to training, PSHSA provides specialized health and safety services such as ergonomic assessments, hygiene testing, health and safety audits, and custom product development. What's more, PSHSA.ca provides access to an assortment of informative reference manuals, DVDs and posters. The website is also home to over 100 free downloadable health and safety resources. From establishing the foundational elements of a safety program to promoting a positive safety culture, PSHSA helps make your school a safer place to work and learn! The Ontario School Board's Insurance Exchange (OSBIE) conducts annual audits of our school board members along with school site inspections for visible compliance of board policies as outlined in the Human Element Loss Prevention (H.E.L.P.) program. Two of the ten audit conditions are Technology Studies Safety and Science Laboratory Safety. Managing the Human Element Factor in any organization is often challenging. However, with education of causes of loss, awareness of proven practices and reinforcement of policies and procedures, school boards can reduce their loss profile. This ultimately means fewer injuries, property losses and disruptions to educational programs. By modifying procedures rather than promoting expensive changes to physical attributes of buildings, school boards can reduce their loss profile without impact to operating budgets. School Boards' Cooperative Inc. is a single source solution provider for a healthy school board. Our promise is to support school boards by providing a continuum of services that promotes wellness, prevention, rehabilitation and return to work. By partnering with our members, School Boards' Co-operative Inc. works to create and maintain a healthy workplace. We provide advice, direction and consultation to member boards on Health & Safety matters, issues and programs, through the provision of training programs, on-site consultations, and various types of health and safety audits, industrial hygiene testing and specific problem resolution. Where appropriate, we work with the Ministry of Labour and WSIB to provide specific recommendations and facilitate input from school boards on program or policy changes at these agencies. We also work with other health and safety partners to maximize opportunities and lower costs to school boards. Our Total Employment Attendance and Management Support (TEAMS) initiative is designed to positively influence the factors that drive attendance – ability to attend work and job motivation. TEAMS is comprised of four distinct yet interdependent elements: Attendance Support, WSIB Claims Management, Health & Safety/Accident Prevention and Actuarial Services. With the advice of experienced consultants and technical specialists, school boards can better plan and prioritize Ministry funding to keep your students safe. To achieve and maintain the highest standards for student safety, Workplace Safety and Prevention Services WSPS offers a range of solutions for school boards. As part of our free Health and Safety Program Gap Analysis, our consultants will meet with key staff and administrators, review your health and safety program, tour a facility, and check legal compliance. We'll pinpoint significant gaps and make recommendations to help you make effective use of staff time and Ministry of Education funds. Other products and services include machine hazard assessments and practical recommendations for every machine in every school; Tech Shop Safety Training for teachers, administrators, and health and safety committee members; Science Lab hazard assessments, reports and recommendations; and a variety of other resources to augment your learning. Most accidents in school science labs are preventable provided schools are proactive in adopting best lab safety practices. As the largest science teachers association in Canada, STAO/APSO promotes and advocates for school lab safety through its conferences, training workshops, and publications. STAO/APSO safety resources are developed by classroom teachers who have a thorough understanding of the curriculum, considerable classroom experience, and a passion for promoting science safety. As a result, STAO/APSO science safety products are a perfect fit for your school board's safety needs. STAO/APSO provides a complete suite of safety reference guides for teachers in grades K- 12. Safe ON Science (SOS), STAO/APSO's secondary school safety text has now been adopted by one third of Ontario school boards as their primary safety reference guide. In the summer of 2013, STAO/APSO will publish its much anticipated elementary science and technology safety resource. STAO/APSO's safety reference guides are available in both print and electronic formats and in both English and French. Obtaining the electronic rights to these guides allows them to be customized to meet a Board's specific needs. Email paul_weese@ stao.org for further details. The resources section of the STAO website, stao.ca, provides numerous articles and videos for free download to support your safety initiatives. Developed through a partnership with the Ministry of Education, the fire safety videos are particularly useful in training staff and students in best lab safety practices. Student worksheets and PowerPoint slides are also available for free download. STAO/APSO also provides safety workshops to meet your professional learning needs. Let our classroom-savvy safety experts guide your staff through engaging and informative sessions on a variety of topics including science safety essentials, chemical storage best practices and new science teacher orientations. Workshops can be arranged by emailing malisa_mezenberg@stao.org. From classroom-ready resources to in-depth workshops, count on the experience and expertise of STAO/APSO to promote a culture of safety in your schools. As part of its work in supporting the Student Injury Prevention Initiative the CODE Health and Safety Team is developing a series of Questions and Answers to assist boards to complete the project objectives of this important initiative. This first set of Questions and Answers focus on safety resources available to the school boards to meet their health and safety responsibilities, and Ministry of Labour safety inspections in science labs and technological education facilities. Why did the Ministry of Labour conduct the recent school safety inspection? Ministry of Labour (MOL) inspectors conducted health and safety inspections in schools to raise awareness of workplace health and safety hazards and to promote compliance with the Occupational Health and Safety Act (OHSA) and its regulations. The stepped-up enforcement was part of the province's Safe at Work Ontario Strategy. What did Ministry of Labour inspectors look for? The Ministry of Labour conducted over 1,900 school inspections of elementary schools (grade 7 and 8) with woodworking shops and secondary schools with technological education facilities (i.e. auto body, construction and manufacturing courses) and science labs across the province of Ontario between September 2011 and June 2012.
unsafe ladders and a lack of guardrails. unsafe use and storage of hazardous materials. What safety resources are available to the school boards to help them in meeting their health and safety responsibilities in science labs and technological education facilities? To guide school boards through the multitude of available health and safety products, the Ministry of Education has compiled and posted on its website links to those resources produced by the Ministry of Labour and other Ontario occupational health and safety system partners. This information can be found here. Public Services Health & Safety Association serves Ontario's public service sectors, including universities, colleges, school boards, municipalities, health and community care organizations, emergency services and First Nations. They help organizations to identify and reduce workplace risks and hazards to prevent injuries, illness and disease. The Workplace Safety and Insurance Board provides no-fault workers' compensation and promotes workplace health and safety. For information about prevention, claims forms, health issues, return-to-work programs, and links to other health and safety organizations, visit the WSIB website. The School Boards Co-operative Inc. also offers services to school boards in maintaining a healthy workplace, including attendance support, WSIB claim management, health and safety, and actuarial services. Visit the website for resources. Are students required to complete mandatory training sessions about health and safety before they begin classroom work (particularly in high-risk areas such as technological education labs and shops and science labs)? While EDU is responsible for developing curriculum policy, implementation of policy is the responsibility of school boards. Teachers plan units of study, develop a variety of teaching approaches, and select appropriate resources to address the curriculum expectations, taking into account the needs and abilities of the students in their classes. Before using any piece of equipment or any tool, as part of good teaching practice teachers provide numerous opportunities for students to be able to demonstrate knowledge of how the equipment or tool works and of the procedures they must follow to ensure its safe use. Personal protective gear must be worn as required. The Ministry does not mandate that students' learning about safety be evaluated before beginning classroom work. The Technological Education and Science curriculum policy documents include both overall and specific expectations related to Health and Safety. Safety must be addressed in classroom learning and in student evaluation such that students acquire the knowledge and skills needed for safe participation in classroom activities; personal protective gear must be worn as required. Is there any way for teachers to teach science or technological education courses without proper certification? As employers of teachers, school boards must take into consideration the safety and well-being of students in the classroom when hiring and assigning teachers to teach specific courses. A teacher must hold a Certificate of Qualification and Registration (CQR) to teach science or technological education. In science courses, the teacher's certificate will normally specify a qualification for teaching science curriculum (e.g. chemistry, biology, science-general) but a teacher whose CQR specifies a qualification in another general education subject may be assigned to teach science by mutual agreement of the teacher and principal and with the approval of a supervisory officer. In technological education courses, the teacher's certificate must specify a qualification for teaching technological education. In limited circumstances, school boards may apply to the Ministry of Education for a Letter of Permission that enables an individual without a CQR to teach a specified subject. This set of Questions and Answers focus on the responsibilities of School Boards to meet their requirements under the Occupational Health and Safety Act. Who is considered the employer under the Occupational Health and Safety Act? The individual Board is the employer. The Board can designate a representative to become the employer's representative. The Board designates the Director of Education, who in turn may designate Deputy Directors and Superintendents and are responsible for health and safety in the areas they control. Who is considered a supervisor under the Occupational Health and Safety Act? A person who has charge of a workplace or authority over a worker is considered a supervisor under the act. Supervisory staff includes, but are not necessarily limited to, principals, vice – principals, managers, front-line supervisors, forepersons, lead hands. It is the Board's responsibility to ensure they appoint "competent" supervisors. How does a Board ensure supervisors are competent? The following questions and answers support student safety in science labs and classrooms. Do prescription glasses with hard lenses provide adequate eye protection during science experiments? Prescription glasses do not provide adequate protection because the eyes are still vulnerable to projectiles entering through the sides, from above and from below. Teachers and students should wear appropriate protective eyewear that fits comfortably over their prescription glasses. An adequate supply of this type of eyewear should be available at all times. Protective eyewear must be worn whenever there is any possible risk to the eyes, e.g., the heating or handling of chemicals and activities that could result in flying fragments of material. Protective eyewear must be worn by both teacher and students until all experimental work is complete. Students who have finished their work are still vulnerable to projectiles resulting from accidents in experiments still in progress. Are portable eye wash bottles suitable substitutes for eye wash stations? Permanent plumbed-in eye wash stations are preferred over portable eye wash bottles, particularly where chemicals are used. According to the Canadian Centre for Occupational Health and Safety, the first 10-15 seconds of exposure of the eye to a hazardous chemical are particularly critical. Any delay in treatment could result in serious injury. The American National Standards Institute (ANSI) Standard for Emergency Eyewash recommends that the eyes be flushed thoroughly for at least 15 minutes with a clean supply of water. A large volume of water is required because water does not neutralize the chemical – it merely dilutes the chemical and washes it away. How can you assess whether or not a chemical is safe? Several school boards have developed their own science chemical list that outlines which chemicals are acceptable, banned, or have restricted use. Use this list as your first source to assess the safety of a chemical. 2 Moderate Safe but proceed with caution. Consult the MSDS for this chemical for more detail about its hazard and the precautions required to safely handle it, e.g., toxicity of copper (II) sulfate. The HMIS rating is often provided on the MSDS that comes with chemicals purchased from the chemical suppliers most schools use. It is also readily available online. A similar hazard rating system is provided the National Fire Protection Association (NFPA). How can you determine whether or not organisms used in biology experiments are safe? The general rule of thumb for obtaining safe organisms is purchase them from an approved source. For example, preserved specimens for dissection should be purchased from board approved vendors. This helps to ensure that the specimens were prepared and preserved in a safe manner. Fresh organs, e.g., eyes, hearts, and kidneys may be purchased from a butcher or abattoir since the animals they came from were inspected and deemed fit for human consumption. Organisms of unknown origin, e.g., road kill, should not be brought to school. Microorganisms used in culturing experiments should also be purchased from board approved vendors. These organisms come classified according to their Biosafety Level (BSL), which ranges in value from 1 to 4. Organisms with a BSL-1, e.g., some yeasts, are deemed low risk and unlikely to cause disease in humans while others with a BSL-2 are a moderate risk. An example of a BSL-2 organism is Salmonella. According to Safe ON Science , only BSL-1 should be used in schools. Organisms swabbed off surfaces like computer keyboards and bathroom surfaces should not be cultured because they may contain BSL-2 pathogens or worse. What are appropriate precautions to take when handling flammable liquids? Flammable liquids should only be handled in a well-ventilated room in which there are no ignition sources present, e.g., open flames or electrical devices which could produce a spark. It is assumed that the room has a class ABC fire extinguisher. Ideally, flammable liquids should be handled in a spark-proof fume hood. The volume of flammable liquids brought into a classroom should be just enough to complete a required task, e.g., disinfect a surface. If any liquid remains it should remain in a tightly sealed container. Stock bottles of flammable liquids should not be brought in the classroom. For specific examples of best practices in handling flammables, see the STAO fire safety video series which is available for free download at http://stao.ca/res2/fireintro.php. Where should School Boards post an annual inspection report for Auto Hoists? Ministry of Labour inspectors wrote up School Boards for not having the paper work accessible in the class where the hoist was located. These reports must be kept in the Auto Shop. The suggested practice is to have the report in a protective clear sleeve mounted on the hoist. It is also recommended that the Principal or Vice Principal in charge of plant retain a copy of the report in the main office. Do Auto Shop Teachers need a Certificate of Qualification mechanics License when they run a service shop? Yes. Teachers must be licensed Mechanics when working on automobiles that will be driven on public roads. Certificates must be posted in the shop and must be current. Should School Boards have a written Preventative Maintenance Program for Tech and Science Lab equipment? This is a highly recommended practice. In case of an accident (either staff or a student), the first thing an inspector or insurance adjustor will require is a copy of any maintenance records of repairs or modifications to a particular piece of equipment. This will ensure Due Diligence for the School Board. School Boards should also have a process in place to address emergency repairs or replacement of equipment. Teachers must be able to lock out a machine and have confidence that a qualified tradesperson will repair or replace as soon as possible. This will ensure that the core curriculum can be delivered with minimal disruption. It is also advisable to have a complete inventory of equipment .This should also include inspection annual inspection reports. This practice will also assist School Boards with equitable access to programs and long term sustainability of resources.